Summer Olympics Open With A Bang In Beijing Amid pollution, protests and impressive pomp and circumstance, the opening ceremony kicked off the Beijing Olympics Friday. More than 90,000 visitors were in attendance. 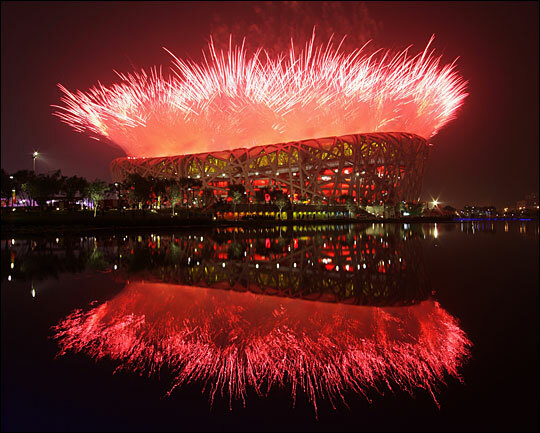 Fireworks explode over National Stadium, called the Bird's Nest, during the opening ceremony for the 2008 Olympic Games on Aug. 8 in Beijing. 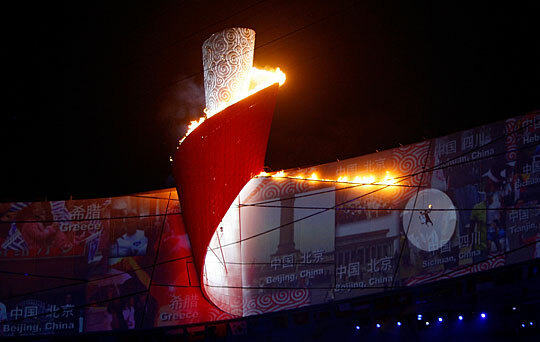 The Olympic flame is lit by Li Ning, former Olympic gymnast for China, during the opening ceremony for the 2008 Beijing Summer Olympics at the National Stadium on Aug. 8, 2008. Amid pollution, protests and impressive pomp and circumstance, the curtains rose Friday on the XXIX Summer Olympics in Beijing. 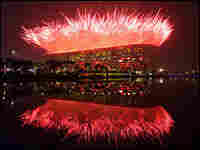 The four-hour opening ceremony at the 91,000-seat Bird's Nest stadium was a gaily colored extravaganza punctuated by fireworks and festivities, including a guy-in-the-sky lighting of the Olympic flame. Gymnast Li Ning, who won three gold medals for China in 1984, was lifted by wires for the spectacle. He circled the Bird's Nest once, gliding through the air like a spacewalker. Then he used the torch to light the massive Olympic caldron. The ceremony will be shown on TV Friday night in the United States. The anticipated crowd around the world may make this the most-watched television event ever. The event, directed by Chinese filmmaker Zhang Yimou, drew on China's history and cultural heritage and displayed it all with high-tech wizardry. Fireworks, a Chinese invention, were set off in great waves, from within the Bird's Nest and from as far away as Tiananmen Square, several miles to the south. 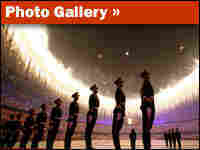 Country by country, athletes strolled around the stadium in hot, hazy weather. China's squad of more than 600 was led by NBA tower Yao Ming and a young boy who lived through the spring earthquake in Sichuan province. There were thousands of musicians and performers to delight the crowd. In Beijing, the long-anticipated day was greeted with joy and enthusiasm. Those lucky enough to secure tickets cheered long and hard for China's Olympic team, the last and largest of the 204 delegations to march in the parade of nations. 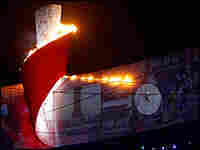 Fans swirled red scarves, waved little Chinese flags and helped illuminate the Bird's Nest with glowing colored torches. But for those expecting to see a nationalistic opening ceremony, bristling with pride over China's rapid economic development, it didn't happen. The festivities were artistic, even whimsical at times, rather than political. Dignitaries from around the world, including President George W. Bush, witnessed the event. So did Russian Prime Minister Vladimir Putin on the day that a conflict escalated between Russia and the former Soviet republic of Georgia over the breakaway region of South Ossetia. Before the opening ceremony in Beijing, Bush christened a huge new $434 million U.S. Embassy and took the opportunity to chastise the Chinese. "We strongly believe societies which allow the free expression of ideas tend to be the most prosperous and the most peaceful," he said. The White House said the president's weekend will be a melange of statesmanship and sports: He will continue to meet with Chinese President Hu Jintao and other officials, and he will cheer on American athletes, including swimmers and basketball players. And it was the athletes who got the great roars from the crowd — and not just the Chinese heroes. There were cheers for tennis great Roger Federer from the Swiss delegation, for the German NBA star Dirk Nowitzki and the tennis-playing Williams sisters (Venus and Serena) from the U.S. And cheers, too, for the unknown athletes from little-known countries like Aruba, Montenegro and Kiribati. Earlier, while athletes settled into the high-rise residential apartments of Olympic Village, protesters staged demonstrations elsewhere, criticizing China's human rights policies at home and abroad. For the next 16 days, the world will be bombarded with a similar mixture of diplomacy and sweat. Thousands of athletes will compete in an array of sports. Concern about the hazy air permeated the first day of activities. Zhu Tong, an associate professor at Peking University's College of Environmental Science and Engineering and an adviser to the government, told The Associated Press, "The stagnant air in Beijing has helped pollutants accumulate. I really hope in the next couple weeks, we'll have conditions that will help us clear up the sky." Scrutiny: For the first time, according to the Broadcasting & Cable Web site, viewers in the United States will be able to see all 35 Olympic sports on television — network or cable — or the Internet. Some 3,600 hours of events will be shown. Security: Following a recent deadly truck attack by a mostly Muslim ethnic group in western China, near the Afghanistan-Pakistan border, Olympic officials have been on increased alert in Beijing. Sappiness: The airwaves and Web sites are alive with tales of athletes who have overcome personal hurdles. And in China, thousands of people are getting married or hoping to deliver babies on opening day — the eighth day of the eighth month of 2008, considered numerically lucky. More than 16,000 couples applied for marriage licenses. Skill: The best athletes in the world will come together on one magnificent stage to test their finesse and fortitude against the rest of the best. Well-known champions such as NBA superstar Kobe Bryant, tennis legend Federer, runner Tyson Gay and swimmers Michael Phelps and Dara Torres will be showcasing their mad skills. So will athletes vying for the gold in lesser-known sports, such as table tennis, team handball and water polo.